Your purchase helps our nonprofit mission. For generations hikers in Europe have collected pictorial medallions of different regions to attach to their staff. Each unique medallion serves as a memento of a new region or new trail explored. Each medallion is made to detailed specifications, hand-made by a master engraver and then individually hand-painted. Pin them to your walking stick as a memento of your travels. Collect them all! Features: Metal. Comes with 3 pins. 1.25 x 1.5 in. Become a Member and Get 15% Off! As a member, you get a 15% discount on everything we sell (except recreation passes, native crafts, and goods for resale). Plus, you'll be supporting our mission to help more people become stewards of Northwest public lands. You'll enjoy other benefits, too. Get an annual membership now for only $15. Find out more about membership. Discover Your Northwest promotes the discovery of Northwest public lands, enriches the experience of visitors, and encourages stewardship of these special places today and for generations to come. Your purchases and donations help support educational programs and services that inspire visitors to become stewards of Northwest public lands. We are a 501c(3) nonprofit based in Seattle, supporting visitors to public lands in Washington, Oregon, Idaho, California, and Montana. We are proud to be partners with the National Park Service, U.S. Forest Service, Bureau of Land Management, Bureau of Reclamation, Army Corps of Engineers, City of Seattle Parks and Recreation, and Washington State Parks. Get 15% Off This Item Instantly! 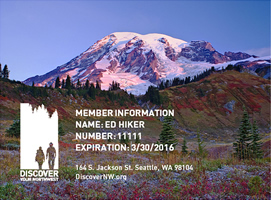 As a member of Discover Your Northwest, you get a 15% discount on everything we sell sell online and at over 30 public land visitor centers around the Northwest (excluding native crafts, recreation passes, and good for resale). Your membership also entitles you to a similar discount at other amazing public land areas around the country, like Grand Canyon, Yosemite, and Yellowstone national parks! Best of all, as a member you'll be supporting our nonprofit mission to help more people become stewards of Northwest public lands. Get an annual membership now for only $15. *Membership discount does not extend to native crafts, recreation passes, or goods for resale. If you order on a business day before 12:00 p.m. (Pacific), we will ship it the same day. Otherwise, we will ship it the following business day. We ship from our location in Seattle. Please check with USPS or UPS for their delivery service guarantee. What will the shipping cost? Shipping costs will be calculated as you checkout, but before you enter your credit card number. Rates are based on the weight and destination of your order and include a fee of $1.50 for shipping and handling. Duties and customs charges are the responsibility of the recipient. Can I print out my pass? The self-issuing, print-on-demand National Forest Recreation ePass is now available for day-users. Annual recreation passes are sold as hard-copy only, please allow enough time to receive them in the mail before you need them. Printed receipts will not be honored by the managing park and forest agencies. Delivery estimates are based on ship date, not original order date. ** UPS does not accept packages addressed to PO boxes. Planning a trip to a northwest national forest, national park, or other federal public land recreation site? An entrance or day-use fee may be required. Save time and money - get your pass online now! © 2019 Discover Your Northwest. All Rights Reserved.